Free Wi-Fi a free shuttle to the adjacent airport and free breakfast mean La Quinta Inn & Suites Louisville Airport & Expo is value packed making it one of the most popular hotels in Louisville among our guests. The non-smoking hotel offers 97 rooms spread across three floors. Room feature free Wi-Fi TVs with cable microwaves refrigerators coffeemakers and work desks. The hotel has a business center with two computer workstations and printers and it also boasts a seasonal outdoor pool and a fitness center. Enjoy a complimentary expanded continental breakfast with waffles pastries eggs cereal fruit and coffee and juice and if you get hungry later there's a 24-hour convenience store on-site. The hotel is pet friendly and has a free airport shuttle. 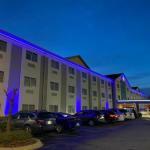 Centrally located near the intersection of I-264 and I-65 the hotel is adjacent to the Louisville International Airport. Downtown Louisville and the rollicking Fourth Street Live entertainment district are a 10-minute drive. The Louisville Slugger Museum and Muhammad Ali Center are within five miles. Dogs up to 60 pounds are allowed. There are no additional pet fees. There is a pet waiver to sign at check in. Dogs are not to use the front entrance; they are to be brought in the side doors. Dogs must be leashed and cleaned up after.